Oh, herbs! You are like our mothers. You are to be found in a thousand places. Discover the power of herbal medicine. Learn which spice in your spice rack can heal a cut, what backyard plant relieves stings, a common ingredient to address infections, and more. Jacquelyn Dobrinska makes ancient herbal wisdom simple and accessible, so you feel comfortable using herbal remedies in your daily life. Time in the field identifying plants and making herbal medicines, including tinctures, teas, medicinal foods, oils, vinegars, and infusions. Return home with clear directions on how to effectively use herbs and herbal practices for health. For more info and to register! Note Tuition includes a fee for herbs and medicine-crafting materials; bring appropriate clothes and shoes for walking outside. Ancient wisdom reveres nature as a source of healing. In fact, Yoga Sutra 4.1 names herbs as one of the 5 ways of awakening. 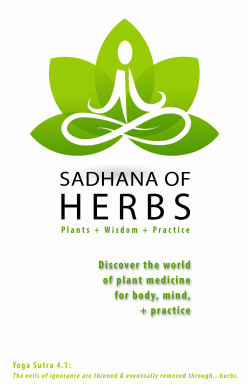 The Sadhana of Herbs is an experiential journey that uncovers the life-giving properties of plants, reawakening this wisdom of our ancestors and making it available for our modern lives. By building stronger relationships to herbs, we empower ourselves in our own healing and reclaim more of our health, happiness and wholeness. · Making herbal medicines: infusions, decoctions, tinctures, oils and vinegars. Take one class or the whole series. Stay Tuned for upcoming workshops. Begin your journey into the world of herbal medicine – where we weave science with ancient wisdom to gain access to health, healing and wholeness. In this weekend we simplify the maze of herbs, learn key terms and actions, explore the history of herbalism and gain confidence in using herbal remedies into our own lives. We will focus on herbs that decrease stress and increase vitality. Also includes Yoga practice for stress & vitality. Good digestion is the root of wellness. If we cannot assimilate nutrients and eliminate toxins, our body, mind, and spirit suffer. Herbs and spices aid the entire digestive process. In this weekend, we’ll not only learn how to use herbs to improve digestion, but also their history in addressing acute and chronic problems. Also includes yoga practices for building our inner fire. No one likes to get sick. When we are healthy we have the energy and ability to live our passion and purpose. Yet, sickness happens. In this weekend we will learn how to support the immune system so that we can stay in good health. We will also learn what to do if sickness strikes, shortening the time we are down. We will learn the difference between colds and flues and the different approaches to both. To stay healthy through the winter, now is the time to build your defense. The physiology and pathology of the immune and respiratory systems. Herbal lung tonics, anti-histamines, decongestants and expectorants. Herbal immune tonics, immune stimulants, antibacterial and antivirals! Herbal Medicine: Making herbal syrups and honeys for immune support. Building your circle of herbal allies: Tonics for our Health! Asana, pranayama, kriya and meditation: Vyana Practices.